Cook tortellini to desired doneness as directed on package. Drain; cover to keep warm. Meanwhile, heat oil in large skillet over medium heat until hot. Add onion and garlic; cook about 4 minutes or until tender and lightly browned, stirring occasionally. Add spinach, tomato, basil, salt and pepper; cook 5 minutes, stirring occasionally. Stir in whipping cream and cheese. Cook until mixture just comes to a boil. Reduce heat to low; stir in cooked tortellini. Cook an additional 4 to 5 minutes or until thoroughly heated. If desired, serve with additional Parmesan cheese. 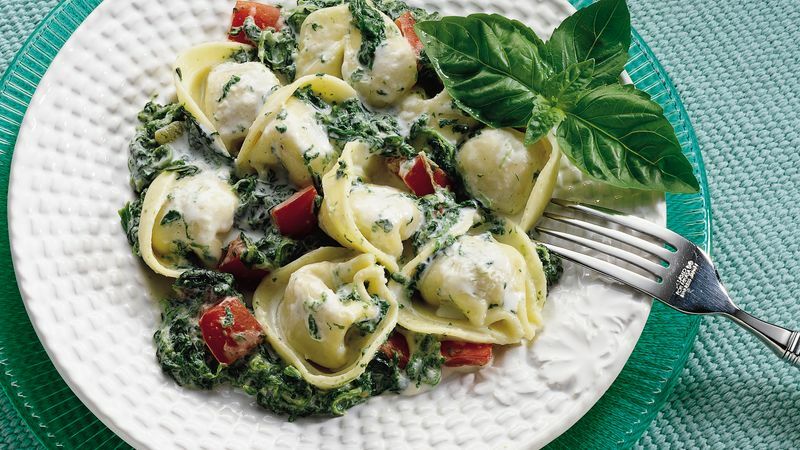 * To quickly thaw spinach, cut small slit in center of pouch; microwave on HIGH for 2 to 3 minutes or until thawed.